I came home from work today, peeled off my clothes and put on a loose sun dress. It is unbearably heavy and hot; the sky is black and we're all wishing the thunder storm would just hurry up and get on with it. We are well and truly smack bang in the middle of summer already. I'm not sure what happened to spring, it seemed to get swallowed up in a couple of days squashed between weeks of miserable rain. 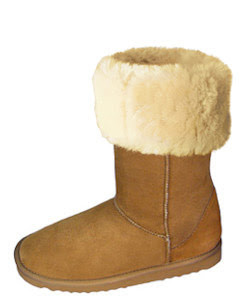 I suppose down in the southern hemisphere it's coming up for winter which may explain why Sarah of Woogau.com.au sent me an email about Uggs. Right now the very thought of pushing my tooties into something soft, furry and enclosed is enough to make me hyperventilate. I've never bought an Ugg boot. I'm not a follower of that sort of fashion 'must have' item and generally prefer smarter city boots for work. They look lovely and comfy and I'm sure are a delight to wear but I'd feel like an old biddy stomping around in them. They are also not hugely popular down here in the south of France so I wouldn't even be able to feed off the street cred. However, there are lots of people who love their Uggs, those who practically live in them and maybe even some who go to bed in them. I would too if I lived in an unheated house in the middle of Dartmoor. I remember at university at Exeter there were students who had houses out in the sticks which were so cold their toothpaste froze if they didn't take it to bed. Now there's an ideal Ugg situation. So, if you are in the middle of frozen wastes which is difficult to believe when I'm sitting in 27°C at 10.30pm, and having to take your toothpaste to bed, you may be interested in a special Ugg offer because I know they cost la peau du fesse (du sheep...). If you go to the Woogau website and enter the code SARAHHAGUE into the cart, you'll get $30 USD off. We ship to all countries for $15USD so with the gift card it would mean our most popular classic tall boots would be $99USD to the door anywhere in the world.. The Australian exchange rate is very weak and so it results in pretty decent prices, particularly for Europe..
And of course as the US$ is also very weak, that would cost less than a cup of tea in Euros... with buns. Well, I jest, but you get the idea. What do I get out of this plug? Dunno actually especially as I don't even wear dem boots. No, not even a euro cent for every sale. I can see I'll never make a million before I'm 40.
hihihi - so I am not a fashion victim coz I did not even know that make of boots, looked like Clarks school stuff to me! Well well, didn't know you were an Exeter alum. Did you perchance come across a prof. called Jessica Claridge? One of my petites amies de college ... now retired to France, I believe. Hi expat, no I didn't. What was she prof of? Uggs are high fashion items, ng. Kate Moss swears by them. Seems she was "Head of Learning Development". We were in a semi-professional drama group together. Subsequently we both had brief careers on the professional stage before settling for less precarious work. I have some great stories but if you never came across her you wouldn't give a rat's cul. Ah, no, I never went near Learning Development.